Step 1 First make the strata filling: Heat a large heavy skillet over medium-high heat and add the chicken sausage. Saute until browned, breaking it up into small bite-sized pieces (about 7 minutes). Transfer the sausage to a large bowl and set aside for now. Step 2 In the same skillet, or a different one if you prefer, heat 1 tbsp extra virgin olive oil over medium-high heat. Saute the chopped onions, peppers and celery for about 4 minutes. Add dried oregano, salt and pepper. Transfer to the same bowl with the chicken sausage. Set aside to cool briefly, then add add the sundried tomato bits, parsley, and diced tomato. Mix everything together until well-combined. Step 3 In a separate bowl whisk the eggs and milk together, set aside for now. Step 5 Place the butter in a smaller bowl and melt briefly in the microwave. To the melted butter, add 3/4 cup extra virgin olive oil and mix with a fork. Step 6 Prepare a 9″ X 13″ heavy baking pan like this one or something similar. Brush the pan with a bit of the butter-oil mixture. Step 7 Place 16 sheets of The Fillo Factory Fillo Dough on a clean and lightly damp kitchen towel. Trim the fillo sheets slightly with a pair of scissors, and cover with another clean and lightly damp towel. Keep the fillo covered as much as you can while working. Step 8 Now, line the baking pan with 1 fillo sheet. Brush generously with the butter-oil mixture. Fold in excess fillo. Repeat with next 7 sheets. Step 9 Sprinkle the top of the last fillo sheet with grated Parmesan cheese. Step 10 Lay the next 8 sheets of fillo, one sheet at a time. Brush each sheet with the butter-olive oil mixture, but do not fold. Instead, drape any excess fillo to make a “nest” for the strata filling. Step 11 Now spread the strata filling evenly across the pan lined with fillo dough. Pour in the egg-milk mixture,and fold the excess fillo in to “encase” the strata filling. Step 12 Bake in the 350 degrees F heated-oven for 30-40 minutes or until the eggs dry and the strata filling puffs up. Remove from heat; wait 4-5 minutes and cut into 12 squares. Serve warm with your favorite salad. 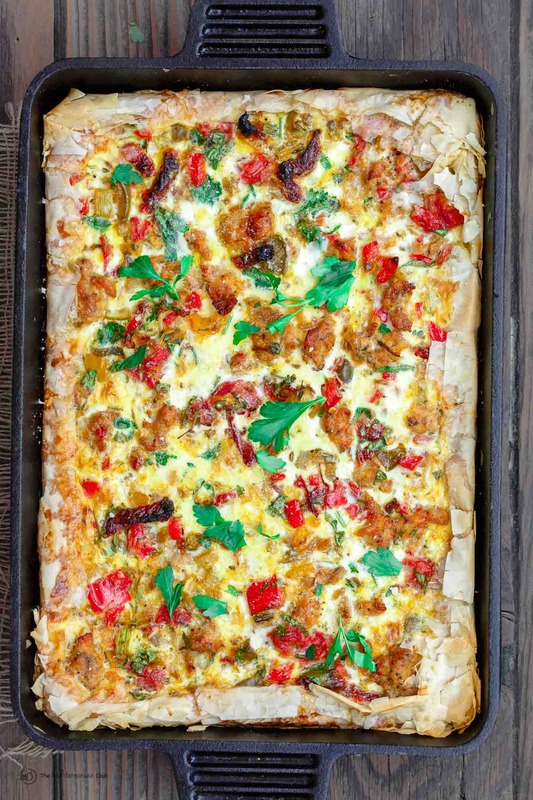 Italian-style strata recipe made with flaky fillo (phyllo) crust. Not your average breakfast casserole! Be sure to see the video and the step-by-step tutorial below the recipe!